I have 10 acronus backups from 10 different machines with different hardware configurations. I would like to recover them to different virtual machines. I can easily do this if I manually restore each machine one by one and apply the universal restore. But this is a very time consuming process. Is there a way to automate this process? What is the best way to minimise the user interventions? Which acronus product would be the best to use ? The proper way to automate conversion of machines backups into VMs is to enable "Convert to VM" feature inside the backup plan: https://www.acronis.com/en-us/support/documentation/AcronisBackup_12.5/index.html#38859.html - it will be restoring each backup into separate VM and will update it incrementally with each plan execution. If you have Acronis Backup 12.5 "Advanced" license then you can create such "conversion" plans independently from backup plans in "Plans" -> "Conversion to VM" section of backup console. Thank you for the reply. Yes I am trying to follow this method. I have built an ESXi server and installed acronus 12.5 advanced in another machine in the network. I have created a plan in conversion to VM and have added my backups to the plan. Once I run the plan. 1. It does create separate Vms for each backups. However these backups have different hardware configuration and drivers. so the vms fails to start with Blue screens. Is there a way to include universal restore in the conversion to VM process so the necessary drivers get installed in each newly created virtual machines? thank you. Really appreciate your help. Acronis Universal Restore is always applied automatically during conversion into VM (the drivers for VMware platform are present on the agent which performs the conversion), so in your case the issue could be in specifics of the backed up systems, e.g. if you perform usual recovery from these backups onto the same ESXi host (restore instead of convert to VM) then likely there will be similar symptoms. If the VMs do not boot then this problem should be investigated with our support team involved - probably there are some specific HW drivers which cause the BSOD or there is something else. Before submitting the support request please make sure to collect system reports (https://kb.acronis.com/content/58301) from both source machine (which is backed up) and from the target VM which doesn't boot after conversion (report should be taken via Acronis Backup bootable media after booting the failed system from it). 1. As informed i followed the above method to restore 10 backups( convert to VM). All backups were converted successfully. however out of 10 there were 3 machines that did not boot up. these machines were winodws XP and they crashed displaying blue screen. As you suggested i will collect logs from these failed machines. 4 So i think that the culprit is this driver and converting to VM process does not apply this driver. I would like to know is there a way to include these drivers in the converting to VM process? Thank you for the additional details. Note that conver to VM uses VMware drivers for SCSI/SATA virtual controllers used in vSphere (on ESXi only), while VMware Workstation may use different type of devices, so comparing conversion to VM on ESXi versus recovery to VM on VMware Workstation using bootable media is not really applicable. A better case would be to restore to an empty new ESXi VM by booting it from Acronis Backup bootable media (e.g. use ESXi VM instead of VMware Workstation VM) and see if there are any prompts for specific drivers. The main problem here is that the XP machine didn't boot successfully after conversion to ESXi VM and this is what needs to be further investigated with our support team involved. It might be not just some missing driver but something else. I am wondering is there a way to extract .XML file from a.TIB file. without .xml file all the converted machines shows as _converted without the backup name. Can you please clarify what kind of .xml you want to extract? The converted machines names are added with the suffix ("_converted" by default) defined within the backup plan, so there is no notion of archive where the machines are converted from. If you're converting the same machine using different backup plans then I'd suggested to change the suffix in the plan settings to distinguish between these machines (if required of course). I am restoring backups from different PCs in to one ESXi machine. I believe when you take a backup with acronis it creates a .TIB file and a .XML file. .XML gives me details about the backup machine name , ID etc. However, this time I have forgotten to copy the .XML and only have .TIB with me. 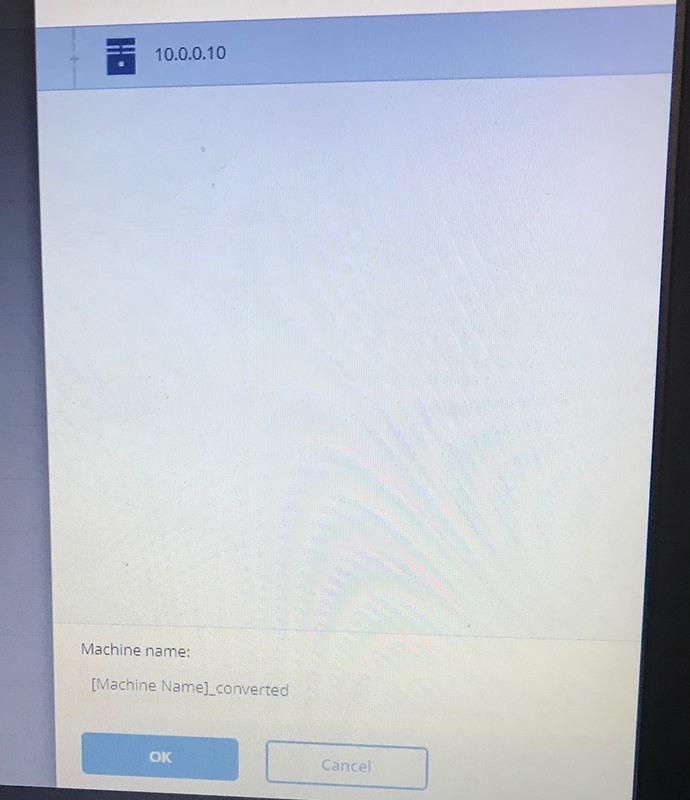 so all machines gets converted as _converted without the machine name. 1. Is there a way to extract .xml file form .tib file? 2. Alternatively is there a way to get the file name of .TIB as the converted VM machine name? Thank you for the clarifications. The .xml files contain metadata for legacy archive format (version 11) which is used to show the archive in backup UI (includes machine name and some other non-essential parameters), however even if this .xml file is deleted, the machine name is still preserved within the archive and regardless of .xml file presence the machine name must be present when you run the Convert to VM tasks. 1) Create a backup of small Linux machine using Agent for Linux. The archive was created in legacy archive format. 2) Move only the archive .tib file to another location and share it over network. Do not copy the .xml file. 3) Create a Convert to VM plan where source ("Items to convert") is the entire network shared folder which contains the copied .tib archive and target VM is on ESXi host (using "[Machine Name]_converted" template). Can you please clarify what are the settings of your Conversion to VM plan? What is the difference between my steps and the ones you followed? yes my method also exactly the same. I also select the location where .tib files are located. Only difference is I had 10 .tib files in this location . Since they don’t have .xml file all machines got converted as _converted. Now I have 10 vms in my ESXI with same name. Which is _converted. Very strange.. When I had the .xml file , I could get the right machine name which is same as the .tib file name . Do u think if I use acronis 12 series to take backups this problem will be solved? I believe there will not be any .xml or meta data folder with 12 series and believe everything is built in to .tib file. In your case the behavior is most likely caused by specifics of the originally created archives that they miss some metadata inside. The missing .xml files are very unlikely to be the actual root cause. Therefore you can try to re-create the backup archives using default "Backup format" (Backup Options->Backup format->"version 12") and see if the problem is still reproduced. If it does then the next step would be to contact our support team for further assistance (the issue should be in something else then). Thanks again for the extended support. in a nutshell this is what I did to test acronus 12.5. Because we use to use 11.7 and now want to migrate to 12.5. 1. Get a machine backup using acronus 11.7 boot dvd from a physical machine in a remote location. 2. transport this backup, only the .TIB file to my lab. 4. in this case what I realized is without the XML file I cannot get the file name as machine name. it get displayed as _converted. so in order to test the acronus 12.5 I did the following. I gave a logical name such as "nametest" as my backup file name. In this case also the new vm machine name was displayed as _converted. I was hoping to get nametest_converted as my virtual machine name. In addition . I want converted VM machine name to be the name of the .TIB file. Thank you for the additional details - the issue is clear now and the problem is in how you created the backup image. Since you used the bootable media to create the backup, there is no such property as "machine name" in the backup archive metadata, so such backups cannot inherit the machine name. If the backup was created by Agent for Windows/Linux/VMware/Hyper-V then this property would've been present and there will be no such issue. In future versions of Acronis Backup we plan to add more variables (for example [Archive name]) to the name of the converted VM (internal feature ID: ABR-211892) and for now the only option to properly convert multiple backups via separate Convert to VM plan is to ensure that these backups are created within the guest OS (not by bootable media). Thank you for the clarification. When would be the feature available with bootable media and with which version. I am currently in the phase of product finalisation for one of our major projects . The feature I refer to is unrelated to bootable media and would instead extend the naming capabilities in Conversion to VM plans by adding more variables for VM names. It will solve your scenario too where the root cause of the problem is missing property in the archive metadata. One more idea: since conversion to VM is essentially a "recover to VM" operation then for automation purposes you can use Acronis command line utility with "recover vm" operation: https://www.acronis.com/en-us/support/documentation/AcronisBackup_12.5_Command_Line_Reference/#37479.html . Here you can define custom name for each recovered VM and also make other adjustments to VM parameters.